Fall is upon us. Soups are always a crowd pleaser n cooler, fall weather. Out of all of the potatoes soup recipes, this one is definitely my favorite. 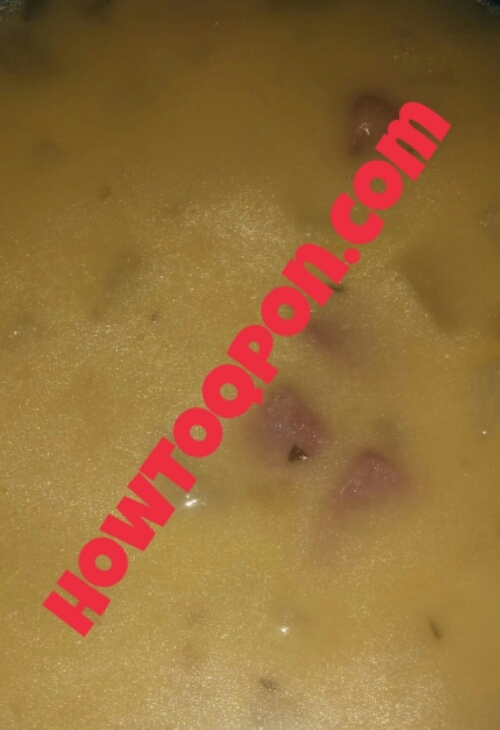 Combine potatoes, celery, onion, ham, and water/broth in stockpot and bring to boil. If you chose the water and bouillon option instead of broth, then stir in the chicken bouillon at this point, salt (if using), and pepper. In separate saucepan, melt butter over medium-low heat. Whisk in flour and cook stirring constantly until thick. Slowly stir in milk as not to allow lumps to form and all milk is added. Continue to stir until thick. Stir the cheese mixture into the stockpot and cook until heated through. Save on Kraft Shredded cheese. ← Oxi Clean ONLY $.99!